For months, national news outlets and pundits predicted that the U.S. Supreme Court’s decision in Janus v AFSCME would be the “death knell” for American labor unions. And while other public sector unions have taken a hit, IBEW 1245’s public sector membership has remained relatively unscathed. That’s no happy accident. 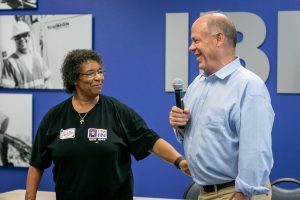 Local 1245 knew that the decision — which overturned 40 years of precedent by eliminating unions’ ability to collect fair share fees in the public sector — was coming, and the union spent more than a year preparing for it. 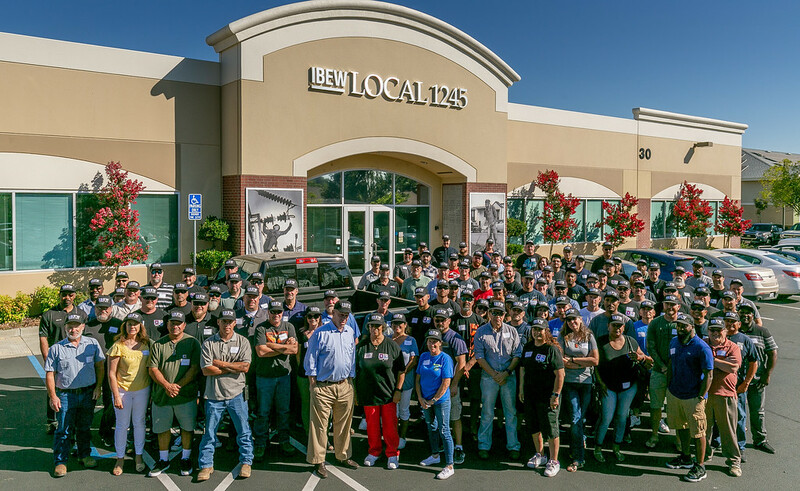 IBEW 1245 organizers and public sector business representatives worked together to identify, recruit and train Volunteer Organizing Committees (VOC) members at nearly all of our public sector employers. These VOCs became a powerful organizing task force, committed to reaching out to their co-workers one by one. In more than 2,000 face-to-face meetings, VOC members engaged their co-workers in conversations about the union difference in their lives, the power of having a seat at the table, and what public sector union members stand to lose if our contracts and MOUs are weakened or lost. 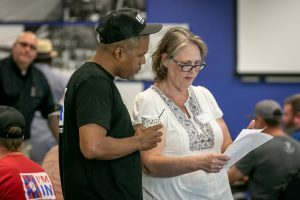 That effort proved incredibly fruitful, and at a post-Janus summit in July at the union hall, more than 100 VOC members from dozens of public sector properties came together to celebrate their achievements and plan for the challenges that still lie ahead. In the weeks leading up to Janus, predictions were grim. 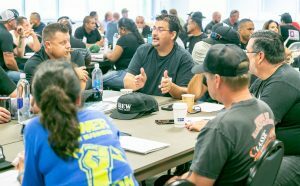 Some experts indicated that at least 30% and perhaps as many as 60% of public sector union members would drop their membership immediately following the decision — but IBEW 1245 experienced less than a 1% drop in membership, evidence that our organizing model is truly one for the books. 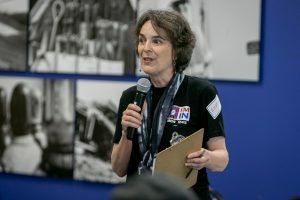 While the union’s leadership and staff played an important role, this exceptional result could never have happened without the hard work and dedication of the VOCs, who spent every free minute they had to educate, engage and empower their coworkers to build a stronger, more unified union in the face of thinly-veiled attacks designed to weaken and divide us. The summit kicked off with an insightful debrief, as each VOC had the opportunity to share their successes and highlights from their respective organizing efforts. The VOC at the City of Redding had a similar experience, and found that Janus, which was clearly intended to weaken unions, has actually proven to have the opposite result, especially among members who were not very engaged in the union before. 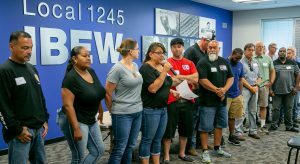 Many of the VOC members expressed gratitude to the union for turning this obstacle into an opportunity to build worker power for themselves and their colleagues. Sacramento Regional Transit VOC leader Connie Bibbs echoed those sentiments. After each VOC had the opportunity to share their experiences, a panel of policy experts briefed the VOC members on the nuts and bolts of organizing in a post-Janus environment. In addition to detailing the changes put in place by the Supreme Court decision, the panel, which included Local 1245 staffers Ray Thomas and Al Fortier, Business Manager Tom Dalzell, and legal expert Arthur Liou from the law firm Leonard Carder, who explained some of the new local and state laws that can help unions counter-act the negative implications of Janus. VOC members spent the afternoon brainstorming and discussing ways to ensure that the union remains strong in this post-Janus environment. 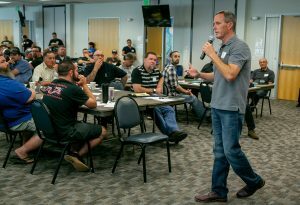 The VOC members will continue to play a large role in keeping current members engaged and active, as well explaining the value of union membership to all new hires. While the summit was largely celebratory in nature, not a single member lost sight of the fact that Janus won’t be the last attempt to take down the labor movement, as it continues to serve as the last and best line of defense for the middle class.